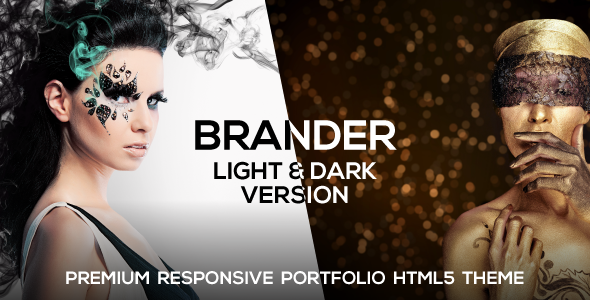 Brander – Premium Responsive Portfolio HTML5 Theme Created by AVAThemes. This templates have specific characteristics, namely: Brander has features such as High Resolution: No, Compatible Browsers: IE9, IE10, IE11, Firefox, Safari, Opera, Chrome, Columns: 4+ . You can use this Brander – Premium Responsive Portfolio HTML5 Theme on Site templates category for animation, creative, css3, dark, gallery, html5, light, masonry, portfolio, responsive, responsive template, responsive theme, template, timeline, timeline template and another uses. Brander is a Premium Responsive Portfolio HTML5 Template with a clean and professional design which will be a great solution for your business, portfolio, blog or any other purpose. Brander is a modern template with fuly responsive design. It has a wide range of features and comes with popular Revolution slider and isotope plugin. It is very easy to customize and comes with detailed documentation and top notch support. The template has five styles of homepage layout + more than 10 other page templates you can use. With tons of layout possibilities, unlimited variations, multiple colors and a bunch of features you can create one unique variation in just a moment. 2 Color Schemes: Black & White – Create your custom color scheme with only a few clicks!